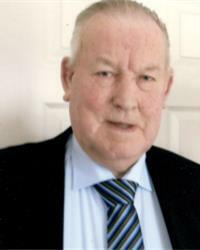 ALLEN - December 6 2018 (peacefully) at South West Acute Hospital, Enniskillen, Cecil Douglas (Dougie), late of 38 Slievebane Road, Irvinestown, beloved partner of Sarah, dearly loved father of Mark (Lorraine), Cyril (Pauline), devoted grandfather of Stephanie, Thomas and Lewis and dear brother of Winston, Ivan, Noreen, Violet & Hazel. Funeral from his home, 38 Slievebane Road, Irvinestown on Saturday leaving at 1.00pm for service in Derryvullen North Parish Church, Irvinestown, followed by burial in Ardess Parish Churchyard. Family flowers only please, donations in lieu if desired to Chest, Heart & Stroke Association, cheques should be made payable to W T Morrison, Funeral Directors, 41 Darling Street, Enniskillen, BT74 7DP. I am sorry to tell you that Cecil Douglas (Dougie) ALLEN has passed away.